As you read this, 1.5 million Australians of all ages are experiencing kidney failure – failure that can lead to chronic kidney disease and the end of life as they know it. The alarming thing is: none of these people know that it’s happening, since you can lose up to 90% of your kidney function without any symptoms. One of those 1.5 million Australians could be you… right now. You just don’t know it. 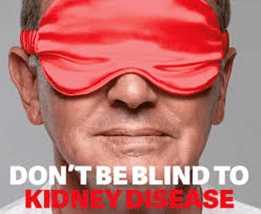 April 8-14 is Kidney Health Week 2019, a perfect time to remind all Australians not to be blind to kidney disease and the importance of undertaking a very simple online kidney risk test at www.kidney.org.au.